The bursas are small fluid-filled sacs that act as cushions between the bones, tendons, muscles and joints of the body. There are many bursas throughout the body. Bursitis is simply inflammation of the bursa. 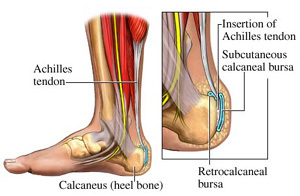 In heel bursitis, the bursa separating the Achilles tendon from the joints, bones or the muscles of the lower foot are inflamed. The symptoms include localized pain and/or stiffness in the back of the foot or heel, which may make it difficult to move the ankle from side to side or simply to walk. As with other types of inflammation, there may be redness or swelling, which can make it difficult to wear shoes. In most cases, the cause is repetitive movements or excessive pressure on the bursa, such as might occur during a sporting event. A traumatic injury, such as landing on the heel from a high jump can put too much pressure on the bursa, causing them to spread out. As the inflammation and swelling continue, the muscles, joints and tendons can start to press on the bursa, causing further inflammation. So, the condition can worsen, without additional injury. Rheumatoid arthritis, which causes joint deformities, can cause increased pressure on the bursa and lead to bursitis. But, rheumatoid arthritis typically affects other joints of the body first, such as those of the fingers and toes. The term may also be used to refer to any non-specific pain in the heels of no known cause. So, if you receive a diagnosis of heel bursitis, the cause may be simply “unknown”. Rest, elevation and ice to reduce the swelling are the first steps. Acute cases should be treated in order to prevent the condition from becoming chronic. In other words, when you notice the pain, take it easy for a while. Continued stress and movement can make the problem worse. DynaFreeze is a topically applied, all-natural pain-relieving ointment containing menthol and yerba mate. This is the recommended form of treatment for areas that are difficult to ice down. As it may be impossible to cut out daily activities until the pain subsides, DynaFreeze can be used during the day to relieve pain that accompanies walking or other physical activities. Heel pads and/or silicone insoles may be beneficial for heel bursitis, as well. There’s no need to suffer. Help is available.